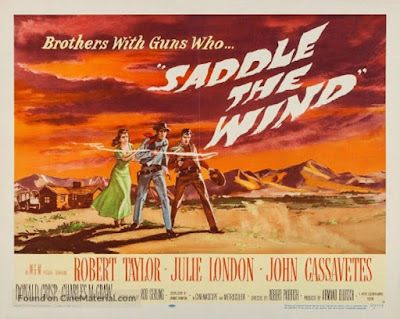 SADDLE THE WIND is yet another Western movie I somehow never saw until now, possibly because I’m not a big fan of its star, Robert Taylor, who usually comes across to me as too dour and humorless. In this one he’s a former gunfighter who has settled down and become a rancher. But of course you know that his violent past will catch up to him. An oddly cast John Cassavetes is his younger brother, who has gunfighting ambitions of his own. Complicating things is the always watchable Julie London, who plays a saloon singer Cassavetes brings back to the ranch. Then some homesteaders move into the valley, bringing more trouble with them as things play out a little like SHANE in reverse. This is a strange little movie. 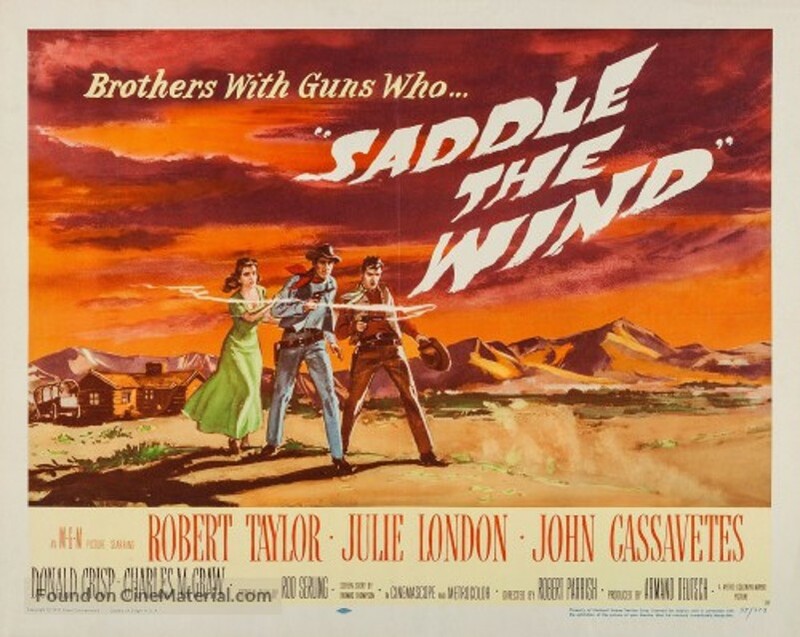 The dialogue is pretty good, not surprising since the screenplay is by Rod Serling based on an original story by veteran pulpster and Western novelist Thomas Thompson. The acting by the leads is okay, although London isn’t given much to do except stand around and look sultry and beautiful, which she does quite well. The supporting cast includes Western stalwarts Royal Dano and Ray Teal. The photography is great, and the action scenes, although sparse, are well done. There’s enough about the movie I liked that I’m glad we watched it, but it’s so relentlessly grim and depressing that I can only give it a mixed recommendation. FYI, both Shane and The Ox=Bow Incident are on TCM today. It's been a while since I've seen it but I remember it fondly, I recall the style being a little influenced by Frank Yerby; I'd also let the Serling association slip from memory. It's quite a nice allegory, a little brother plot utilised as a device for the metaphysical topic of past and present identity. Now I think of it, that is very Serling. It seems that the Director Robert Parrish (see his outstanding The Wonderful Country starring Robert Mitchum, from a compelling novel by Tom Lea) rejected the movie due to disagreements with the production in the cutting-room and that John Sturges filmed new scenes. Remarkable and probably unique in a western is that the young assassin played by a neurotic John Cassavetes shoots himself and die in a yellow-flowered meadow.